In the article Semiology and Urbanism (1967) Roland Barthes points out that it is important to bring an approach to the city which goes further than a metaphorical level. He points to a real level. The metaphor treats the city as a picture but not necessarily the real city. But he gives no further details about this real level (although he mentions Freud's dream theory). 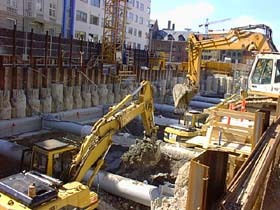 At the moment the Danish State is working in the streets and squares of Copenhagen. They are constructing a wholly new metro system. Until now transport in Copenhagen has unfolded overground; on bikes, in cars and busses. With the use of heavy machinery, the excavation works are in a very concrete way penetrating beneath the picturesque surface of the city. Usually you never see large deposits of mud and clay in a city. They are digging 5 or 6 giant holes in key locations as preparation for the concreting of new stations. 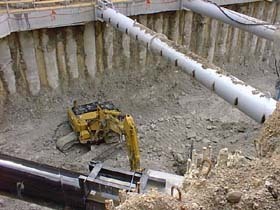 The holes are as deep as the buildings which surrounds them are high - sometimes deeper. Cities usually strive for the sky; and the direct opposition to this movement makes these holes disturbing. They reintroduce in the city a somehow repressed but dynamic world; a world which our ancestors probably fled from when they began to live in large settlements, and then cities, in the first place. A world with its own timescale and its own imperceptible flow. 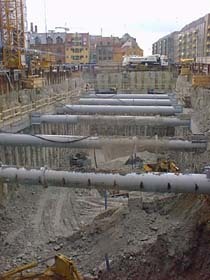 It took only a few months to dig through the layers of culture: first a layer with still functional infrastructure; cables, pipes and sewers, then a historic layer; a section of Copenhagen's old fortifications was found and excavated and then a layer of fill placed there by man over the last 1000 years to reclaim the land from the sea. Now the excavators face a reality of mud and clay. In the first 10 metres under sea level the machines are working through deposits from the ice ages. Layers of mud, boulder clay and moraine sand. The ice from the last ice age melted 15.000 years ago. At that time most of the Copenhagen region was covered by marsh and swamp. Over a period of a few thousand years, plant and animal life slowly invaded the dry territories with the concomitant milder climate. During the present period, the quaternary period, which includes the last 2-3 million years, the region has been covered by ice four times. The glaciers that moved over the region carried clay, sand and mud from the north. Materials made from disintegrated bedrock due to the friction from the ice and other processes of erosion. The ice moved only a few metres every year and slowly raked up and changed the landscape and coastline. The last ice age lasted 10.000 years and the ice sheet, sometimes up to two kilometres thick, slid heavily over the Copenhagen region. The ice left the mud, the clay and the sand for the excavation workers mixed without any clear layering. At minus 10 metres the excavators and diggers meet the pre-ice age deposits. Now they face a reality of rocks and minerals. These layers are settled before the quaternary period and before man evolved. The first layer they meet consists of greensand chalk, then tree layers of Copenhagen limestone, and under those a layer of bryozoan limestone. Some of the stations are going to be situated in the upper layer of Copenhagen limestone, others in the intermediate layer of Copenhagen limestone. That material was deposited there due to huge sedimentation basins, which emerged between the Scandinavian bedrock in the north and the central European bedrock in the south. Due to shifting sea levels and evaporation around 70-80 millions years ago the remains of vast amounts of corals, plankton and other minor lifeforms have been deposited and form the material in which the stations are going to be situated. At that time India had not reached Asia and Australia was still a part of Antarctica. On dry land reptiles were still the most significant vertebrate. In that period they reached the biggest size ever. The tyrannosaur reached a height of up to 12 metres. In the sea the plesiosaur was up to 10 metres long and the cronosaur had a head 4 metres long, while the mosasaur (a new sea serpent-like species, which evolved during Cretaceous) was more than 10 metres long. Imagine a trip in the metro at that time.